Good Evening Mrs. Bridget Kumar! 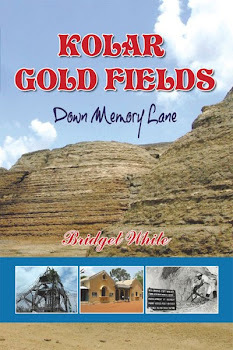 Your book is a great tribute to all the people who were responsible for the birth of great city called Kolar Gold fields and its glory and all the miners and their sacrifices and their families and the all the Officers, engineers and other personnel of Gold mines and their families who lived and made it a great city of vibrant multi-ethnic culture ,secularism, equality and communal harmony . Before I proceed further, I need to tell you briefly about me and my life in KGF. We are from Nellore district of Andhra Pradesh State, and as you observed my grandfather was a drifter from our native place in Nellore who arrived in KGF during its glorious days around 1910 seeking his fortune and settlement and joined in as a domestic help in the house of an English Chief Sanitary Inspector. He got married there and begot children-my dad and uncle. My father Paul got educated up to 8th class in Nellore, worked with English officers as domestic help and later got job as a Time -Keeper in Champion Reefs mines office in Sanitary Department ,responsible for keeping muster rolls of Sanitary workers in Champion Reefs . My father married there in KGF and begot us –twelve children-I am the 9th child. I studied in KGF up to 4th class in Telugu Elementary School in at SC Block, Champion Reefs during the academic years 1959-60 to 1962-63 and went to Nellore and Tirupati in Andhra Pradesh state where I completed my school and college studies –I completer Masters in Commerce in 1975.By God’s abundant grace, I got recruited as Deputy superintendent of Police in the Andhra Pradesh State Police service in 1980 and got into IPS (Indian Police service), and rose to the rank of IGP ( Inspector general of Police) and retired from service on 30th June ,2013. I was born on 10th June ,1953 at the Government Maternity hospital,Robertsonpet,KGF and lived in KGF till May 1963 and went to Nellore for my studies .But our family lived in KGF till 1972 when my dad retired from service and then our family moved from KGF to our native place in Nellore. While studying in Nellore and Tirupati, I came to KGF and spent time during holidays during 1963-1972. All my siblings living in different places in AP, have live and vivid memories of life and times in KGF and as you said, KGF would never leave you. We always pine to visit KGF whenever possible, but the pathetic picture it presents today, makes us very sad. All the three parts in your book are a great reading, as they evoke our memories and furnish us with lots of information unknown to us about many things in KGF and the great community of Anglo-Indians in KGF .As we lived in KGF, we are familiar with Anglo-Indians and their culture. Knowing about you and your family and life and times in KGF also brought out many memories of our life in KGF as the Places and food and festivals are familiar to me. As you observed, there were no means of public transport in the city, except for tangas. We, as children, moved all over the length and breadth of KGF and all the places mentioned by you are familiar to us. 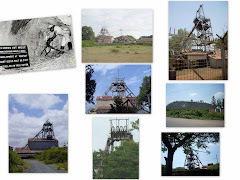 We have moved around all the mining areas-Mysore mines, Champion Reefs, Oorgaum and Nundydroog and the famous shafts, Gifford’s shaft, Edgar’s shaft Bullen Shaft and Henry shaft. 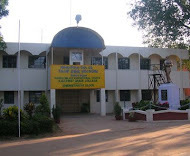 During my childhood I moved in KGF and saw all famous clubs and halls viz., Gymkhana Club, Oorgaum Hall, and Skating Rink. The following chapters in your book impacted my memory very much and brought joy and took me back to my life in KGF. We travelled with in KGF from place to place to visit friends in Marikuppam and Oorgaum and Coramandel and also attend churches and also to go to Madras and Bangalore cities. There was a minor accident on one evening train, when I was going towards Bangalore in our local train with my dad and my dad received a minor injury and the train service was suspended for that evening and we took bus on the next day for our journey. Though we never visited Bethmanagala, but, as children, we visited the water reservoir and meter house at champion Reefs and tried to climb up and see the water and the watchman warned us and sent us away many times. My uncle worked in Municipal Health office, at Robertson pet and we frequented the Town for several purposes –going to shopping and hotels, Cinema theatres like Gay Talkies, Krishna Talkies, Olympia Theatre and going to bus station to go out to outstations in AP.My cousins lived in Robertson pet only.Andersonpert was close to our residence in Champion Reefs and we frequented this place almost daily .I used to go with my dad to Beershop to purchase beef and vegetables and clothes. We purchase newspapers and magazines in Anderson pet.Your book threw light on the origins of these town areas and Beershop. It was not clear for me as to why it was called Beershop though I had a faint idea about it, but your book brought out the reason as to why it was known as Beershop. The church of Our Lady of Victories at Champion Reefs is my favourite church to attend the 24th December Christmas Mass and on other occasions. The depiction of the birth of Lord Jesus Christ in beautifully decorated place in the church is always my source of joy and faith as a child. I have warm memories of attending 24th December Mass and returning home in the cold weather and eating sweetmeats prepared by my sisters at home. I hardly slept on that night. Our friends and a few cousins studied in St. Josephs Convent at Champion Reefs .So I went there several times including on school functions and school days. The KGF Gymkhana Club ,Mysore mine Club Nundydroog Club, The Catholic Club in Champion Reefs ,The king George Hall Club in Robertson pet are our frequent jaunts and my brothers ‘wedding reception was also held at Mysore Mine Club. We are aware of the underground accidents including air blasts etc. ., we used to wake up to the jolts caused by the underground blasts and there were quakes and the housed used to vibrate due to the blasts. All the tragic mining accidents caused gloomy atmosphere in our neighborhoods and any serious accident was the talk of the town, as everyone comes to know such accidents. Now I feel sad for the serious exploitation of mining workers by the John Taylor and Sons Company during the hey days of Gold mining. 9.The birth of a new community: Your book brought out clearly about the birth of Anglo-Indian Community in India and threw light on this aspect. 10) Their way of Life in KGF.As residents of KGF and having seen them in our neighbourhood and as officers, and nurses in KGF Hospital, I have a glimpse of their culture and your book gave more detailed account of their life style .One evening, while I was going with my cousin to my cousin’s house in Robertson Pet, we stumbled upon a wedding function at a roadside house of Anglo-Indians .We stopped there for listening to the orchestra music ,but later we had the opportunity to watch their dancing and merry making and we were spellbound by their dances as it was our first time to see such performances. The Anglo-Indian women excelled in the fields of teaching and nursing-as they were excellent teachers of English language and caring, patient nurses due to their skills and dedication to their duties. As a child, when I was admitted in KGF hospital for a week, and I had had an opportunity to experience the care and affection of a lovely Anglo-Indian nurse who showed utmost care and love and patience while treating me in the hospital ward. She was a Nightingale personified. Since we shared the same space and times in KGF, the vendors were the same and the service providers were the same to all the Miners’ Lines and Officers bungalows except a few. These details in your book are very vivid and brought out lot of interesting memories out of my faded memory and I thoroughly enjoyed reading these chapters, as the other chapters. Of particular interest to me of all the familiar landmarks of KGF are “The Cyanide Dumps” and “The KGF Mining Hospital “.We had our own dumps in Champion Reefs area and they were our favorite spots for playing and gathering for us. They have a special appeal for us all and we can’t imagine KGF without these dumps. When I saw them in Telugu and Tamil movies, I was proudly saying to my friends in Andhra Pradesh that they belong to our KGF City. The Ming hospital at Champion Reefs which we saw as Children and the same now give us lot of sadness .I was in that hospital as an inpatient as a child and witnessed the praiseworthy services of the staff, especially the Anglo-Indian nurses and always compare them to the abysmally poor conditions and services prevailing in Government Hospitals in Andhra Pradesh .Even the nurses in corporate hospital are no comparison to those service oriented and dedicated nurses in the KGF MINING HOSPITAL. 15.Our Local Train: It brings me sweet memories of my journeys from Nellore to KGF via Bangarapet during school holidays. We used to spend half a day to decorate the graves and bring flowers and offer prayers at the graves of our grandparents. The area wears a festive look on that day .I have never observed such observation in any place /town/cities of AP as was seen in KGF. We miss the event always. Other Communities in KGF …Festivals. There was a sizable population of Telugu people from the Districts of Nellore, Chittoor, and Anantapur Cuddapah of Andhra Pradesh, who came and settled there-not as underground miners but -as sanitary workers in all the mines and sweepers in KHG Mining hospital who lived in Marikuppam, Champion Reefs, Nundydroog area, Coramandel area and Oorgaum areas. Most of them were Hindus .A few families belonged to Christianity and we are also Christian. Among them a few are Catholics while the rest are Protestants. We celebrated Christmas with lot of fervor and joy. Bu as you observed in your book, we also participated in the festivals of Hindus and Muslims-especially Pongal and Bhogi (bonfire) and Deepavali and our Hindu friends’ also celebrated Christmas festival.